I read this one mostly because my Mom would not shut up about how great this series was. She started this past November and is now on book 13, so she’s clearly obsessed. With the film adaptation coming up (starring Katherine Heigl and Jason O’Mara) coming out this year I thought I’d give it a shot. Actually much like main character Stephanie Plum just trying something new. After being laid off, Stephanie takes a job as a recovery agent (bounty hunter) for her cousin Vinnie- against the advice of basically everyone she’s ever met. Her target is Joseph Morelli, a cop on the run for a cold-blooded murder. And, a man she has a history with. Sounds intriguing, no? While it sounds like a it could be a typical action/mystery novel what really brings this book to a new level is the character of Stephanie. Her wit, charm, and- as she’s the POV character- her inner monologue are insightful and in many cases pretty hilarious. She’s a sarcastic “every-woman” if you will and she’s way in over her head, and very much knows it. 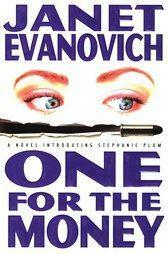 Evanovich creates a world that is engrossing. I’m not sure how the real Trenton, New Jersey feels about it’s portrayal in this novel (and I can only assume the rest of the series) but it’s almost as alive feeling as the rest of the characters. I felt like I knew these characters from the beginning. You find yourself really relating to all the characters and going with them on this emotional journey, I think that’s a hallmark of good writing, when the characters hurt, you hurt. When they triumph, you cheer. Evanovich managed to make Plum so relatable that I had no problems locking into her specific point of view. And, it’s not just the main characters, the whole cast is pretty fully realized. This story is not for everyone, it’s not sanitized in any way. Plum is a bounty hunter and is immersed into a world where very bad people do very bad things. This is the one criticism I have and that’s that SO MUCH HAPPENS to Stephanie in such a short amount of time. That she shows such determination to her task is admirable but it’s surprising that she didn’t just bag the whole thing and take a job flipping burgers. I’m told the series continues in this fashion for the duration, adding various characters to it’s pantheon and I’m sure I’ll enjoy where it goes. But, as with many long series I have fears about the quality waning as the numbers climb (Hello, Sookie Stackhouse books!) and with number 18 recently released (along with several mini “half” novels wedged in there with different continuity), my hope is that Evanovich can keep the stories clean and fresh. Especially as attention will be heaped upon the series with the film.